@YahooSportsNBA / TwitterStephen Curry looked demoralized on the bench after having to leave Friday’s game with an injury in the third quarter. 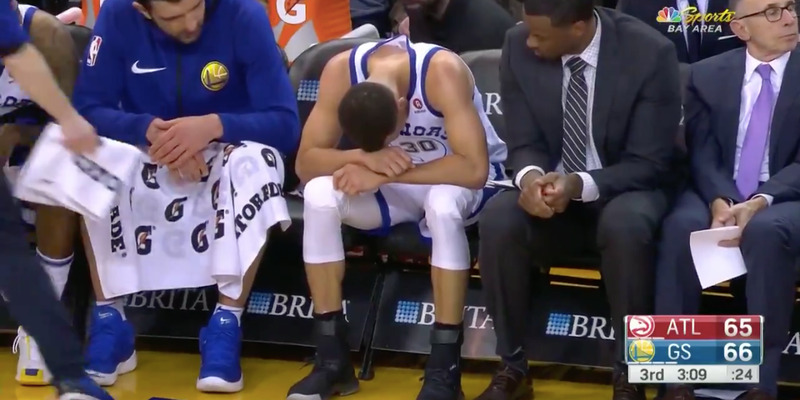 Stephen Curry left the Golden State Warriors’ game on Friday night when teammate JaVale McGee fell awkwardly into his knee. The Warriors initially diagnosed Curry with a sprained knee ligament, but the full extent of the injury will not be known until he undergoes an MRI on Saturday. The game was Curry’s first after missing six games due to an ankle injury. Golden State Warriors star Stephen Curry had to exit the team’s game on Friday night after suffering a potentially serious knee injury. The incident came in the third quarter of the Warriors game against the Atlanta Hawks. Warriors center JaVale McGee went up in an attempt to block an opposing shot, lost control in the air, and came down hard on Curry’s left knee. Depending on the results of Curry’s MRI on Saturday, the Warriors may soon need to find a way to win without their star centrepiece if they want to repeat their 2017 run through the postseason.